3-span 166’-10” long and 64’-0” wide reinforced concrete haunched girder bridge. Balanced span (48’-5” x 70’-0” x 48’-5”) similar to existing bridge. Includes a traffic lane, a bicycle lane, a vehicle barrier and a sidewalk in each direction. The roadway is 5’ higher than at midspan of the old bridge. 3-span 155’-0” long and 60’-0” wide reinforced concrete haunched girder bridge. Constructed in 1914-15 by Charles H. Gildersleeve. Listed on the National Registry of Historic Places (2004). The City of Napa has experienced floods during which the bridges over the Napa River and Napa Creek acted as dams, trapping debris and impeding the flow during high floodwaters. The city created a flood protection plan with the help of the U.S. Army Corps of Engineers (USACE) and replaced the Third Street Bridge over the Napa River, the First Street Bridge over Napa Creek, and built several new bridges over what will become the Napa River Bypass. 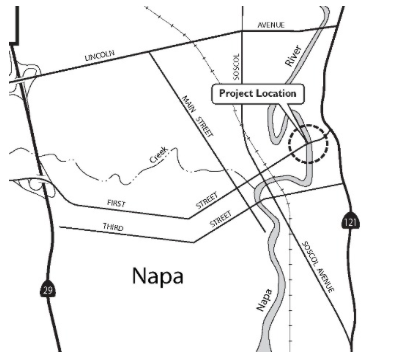 The project to replace the First Street Bridge over the Napa River was completed in 2009 (see project map below). The new bridge has clean lines that compliment much of the development along this part of the Napa River. There is a new culinary school, chef's gardens, and a 'Public Market' with gourmet restaurants. Napa County, California Bridges: First Street Bridge across the Napa River (2) by Mark Yashinsky is licensed under a Creative Commons Attribution-NonCommercial-NoDerivatives 4.0 International License.